Keeping people safe on icy roads with just a pinch of salt. February 6, 2016. We’re all mostly correct in our collective outrage that Flint’s water supply was contaminated with lead after switching from using Detroit’s water system to drawing from the Flint River. As we now know, that river water corroded the lead pipes leading to taps in people’s homes, pushing lead levels in the blood of some children dangerously high. Chloride, the corrosive element in the Flint River, strips lead molecules from the walls of lead pipes and contaminates the water flowing through them. What’s so interesting here is the cause of the Flint River’s corrosive effect on lead pipes. That cause—or some of it—originates in the desire to have dry roads in winter. Since the 1960s we have spent billions of dollars spreading salt with chloride on our nation’s highways to melt snow and ice and prevent crashes, injuries and deaths. 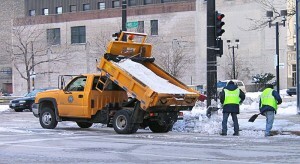 Since 1990 road salting across the country has doubled, reaching about 135 pounds per person per year. The Flint River’s salt concentrations, together with its naturally high salt levels, at one point increased chloride in Flint’s drinking water to eight times higher than Detroit’s, which is drawn from the fairly clean-running Detroit River and nearly pristine Lake Huron. 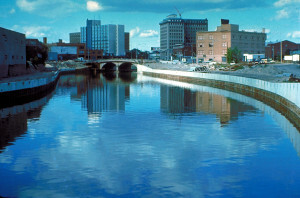 The Flint River, Michigan, under a floodwall lock and key in downtown. Photo US Army Corps of Engineers 1979. Forewarned of the risk of switching to local river water, Flint officials should have upgraded the treatment of drinking water and reduced the chloride—but they didn’t and the rest is unfolding history that may end up as a case study in an environmental science textbook some day. But isn’t it strange that, to make people safe on the highway other people are made unsafe? As always in human affairs, the unintended consequences of our actions cannot be imagined. There’s another turn here. Without knowing it, the people who decided to switch Flint’s water source were in large part simply assessing risk using a standard that was worked out years before by scientists and “stakeholders”— people who would be affected by a regulatory outcome. 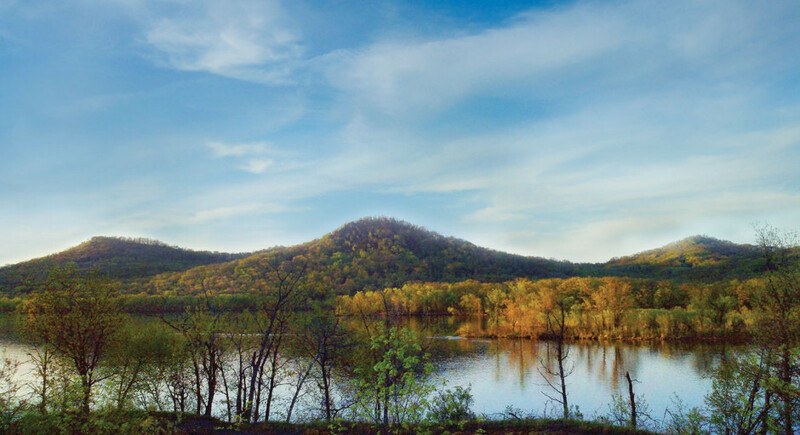 The US Environmental Protection Agency and its local implementer, the Michigan Department of Environmental Quality, employed a regulatory standard for assessing lead in drinking water of 15 parts per billion. (That is the level at which somebody should take action to get the lead out—but the actual target for lead in drinking water is zero.) If 90 percent of the households in Flint at the greatest risk of lead contamination fell below this level, all was well. One step in the assessment process, then, is to ignore crazily high readings, such as discovered at several households by Virginia Tech scientists. In other words, those readings can be ignored because they represent a small risk to society as a whole…or so the logic went.